[146 Pages Report] The starter motor cranks up the engine for initial starting, while the alternator provides the power required for the vehicle electronics. The growth of the starter motor and alternator market can be linked to the increasing vehicle production and rising demand for vehicle electrification. The market for starter motor in terms of value is estimated to grow at a rate of 5.22% from 2015 to 2020, while that of alternator is estimated to grow at a CAGR of 5.38%. Asia-Oceania is estimated to be the largest market for starter motor & alternator. The region houses some of the most populous nations such as China and India, which together constitute two-thirds of the world population. The huge population base associated with economic labor, low production costs, and lenient regulations, provide huge opportunities for automakers. North America is another attractive market for starter motors and alternators, mainly due the low penetration of start-stop vehicles in the region. The region is an attractive market for start-stop systems to grow. The market is estimated to account for approximately 1/4 of the global starter motor and alternator market in 2015 and is projected to grow by value at a CAGR of 4.03% during the forecast. Based on MarketsandMarkets analysis, the LCV and HCV production is estimated to stabilize between 2015 and 2020, after a volatile period from 2004 to 2013. India is estimated to be highest growing market for HCV production, growing at a CAGR of 6.22% from 2015 to 2020. On the other hand, the market for LCVs in Spain is projected to be growing at an impressive CAGR of 7.87% during the forecast period. The growing vehicle production globally is expected to increase the demand for starter motor and alternator. The market for Integrated Starter generators in North America is estimated to grow at a CAGR 34.97%, to reach a market size of USD 9.9 Million by 2020. This report classifies and defines the automotive starter motor & alternator market size, in terms of volume and value. It provides a comprehensive analysis and insights (both, qualitative and quantitative) into automotive starter motor and alternator market, while highlighting the potential growth opportunities in the coming years and reviews the market drivers, restraints, growth indicators, challenges, market dynamics, competitive landscape, and other key aspects with respect to automotive starter motor and alternator products. By Region (North America, Asia-Oceania, Europe, and ROW). Key players in the automotive emission sensor market have also been identified and profiled. With the given market data, MarketsandMarkets offers customizations in accordance to company-specific needs. The Alternator market is projected to grow at a CAGR of 5.38% from 2015 to 2020 to reach a value USD 8,871.5 Million by 2020. On the other hand, the market for starter motor is estimated to reach USD 9,087.3 Million by 2020, growing at a CAGR of 5.22%. Asia-Oceania region is estimated to have the highest market share in automotive alternator market in 2015 and is also projected to lead the starter motor market in the same year. This huge market share can be attributed to growing vehicle production and increasing vehicle electrification. North America is the second fastest growing starter motor and alternator market, where stringent emission norms resulting into development of advance technologies has been driving the market. Stringent fuel emission and fuel economy norms have been introduced by the government globally. This has given rise to the increasing involvement of electrical and electronics components on large scale in an automobile in the past decade. Engine downsizing has led manufacturers to develop starter motor and alternator that comply with the incoming trend. Different technologies such as enhanced starters, integrated starter generator, and direct start have been introduced. These technologies find application in micro-hybrid and hybrid vehicles. Promotion of greener vehicles has been fuelling the demand of these technologies. According to the study done at MarketsandMarkets, Integrated starter generator is projected to grow at the fastest rate from 2015 to 2020. 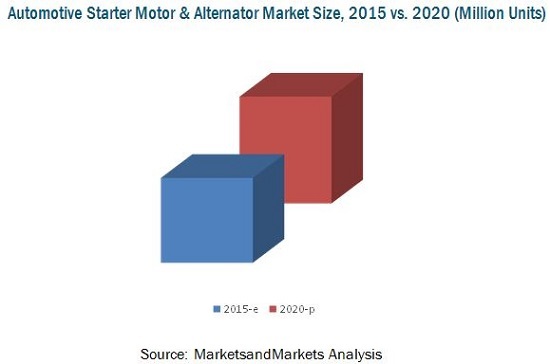 Key Drivers for automotive starter motor and alternator market include increasing involvement of electrical and electronics component in vehicle, which demands more power and increasing vehicle production, is another factor directly driving the demand for starter motor and alternator. However, increasing demand for electrical vehicles has been posing a serious restraint on the growth of this market. 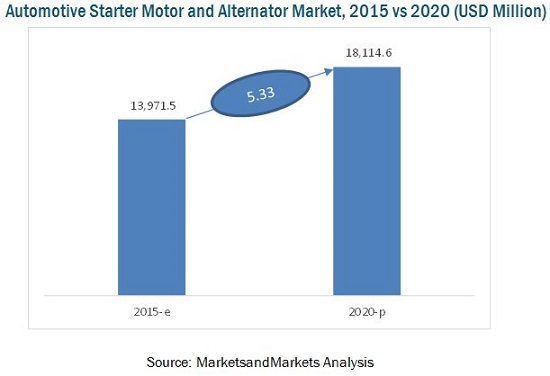 The global automotive starter motor and alternator market is dominated by major players such as Robert Bosch GmbH (Germany), Denso Corporation (U.S.), Valeo S.A. (France), Hitachi Automotive (Japan), Lucas Electrical (U.K.), Mitsubishi Corporation (Japan), Hella KGaA Hueck & Co., (Germany), Motor Corporation of America (U.S.), Control Power Technology (U.K.), and Mitsuba Corporation (Japan). Robert Bosch GmbH is the market leader adopting new product development and expansion as the key strategy to grow. It has developed technology named as direct start that would replace starter motors from vehicles completely.